Donald Dean Stutesman, age 76, of Nevada, Missouri, passed away on Thursday, November 20, 2014. Dean, the son of Jesse J. and Bernice A. (Gillespie) Stutesman, was born June 28, 1938, in Wheatland, MO. 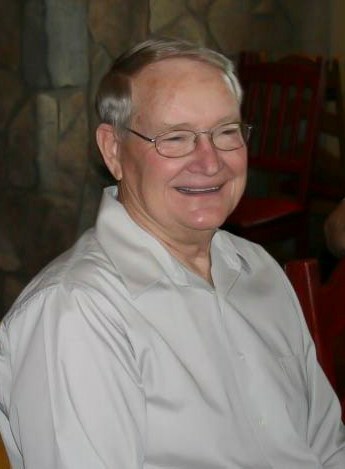 He is survived by his wife, Betty Lou (Dickinson); his son, Robert Dean Stutesman; his three grandchildren: Curtis Lee Stutesman, Leslie Lou Walker and Alissa Paige Stutesman; his brother, Lewis Robert Stutesman and family. He is preceded in death by his daughter, Virginia Lou Stutesman, and his parents. While growing up, Dean helped on the family farm where he mastered the art of “pickin’ rock.” Since there was no running water on the farm, he would go shower in the creek every morning. He learned honesty and integrity while working the hay fields in the heat of the summer and looked forward to cooling off in the pond at the end of the day. The summer after graduating high school, Dean worked the wheat harvest almost all the way to Canada –and then needed to pawn his watch to get back home to Wheatland. He moved to Kansas City and enlisted in the Army in 1959 where he served just over 2 years at Fort McPherson in Atlanta, Georgia. He moved back to Kansas City and started working various jobs. While working at Bendex, he discovered his entrepreneurial skill by buying milk cans from the local farmers in Wheatland and selling them to Bendex in Kansas City. While there, his parents set him up on a blind date with Betty Lou Dickinson. Dean and Betty were married on June 29, 1967, and lived in Kansas City, where Dean and his brother started building homes. In 1970, he and his brother bought a farm and joined their parents in El Dorado Springs, where they continued to build homes together and raise their families. In 1999, Dean moved to Nevada, where he added rental units to his business. Dean was passionate about building, loved working with his hands, cars and trucks, and spending time with his grandchildren. Known as the “political hound dogs” to the morning coffee drinkers, he could be found almost every morning at McDonald’s with his brother drinking coffee. Dean embraced life and was zealous about all aspects of the real estate business. After Dean obtained his broker’s real estate license, Betty soon followed him. Their lives revolved around real estate and their grandchildren. They were not only partners, but best friends; traveling between Nevada, El Dorado Springs and Springfield for the last 30 of their 47 years together. Dean enjoyed teaching his grandson about the housing and rental business and was rarely seen without him. He was known for his honesty, kindness, integrity, and was a man of his word. His lightness and smile were a treat to all whom he met, and he will be greatly missed. Funeral services for Dean Stutesman will be held on Tuesday, November 25, 2014, at Bland-Hackleman Funeral Home in El Dorado Springs with Rev. Kent Parsons officiating. Burial will follow in the El Dorado Springs City Cemetery under the direction of Bland-Hackleman Funeral Home. Pallbearers are Andy Anderson, Lindel Holt, Elvin Green, Larry Bland, Trent Yarsulik and Dwain Reed.